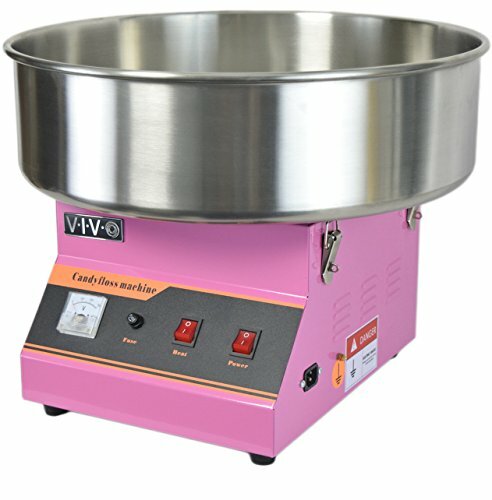 New Table Top Hard Candy and Sugar Cotton Candy Maker from VIVO! The CANDY-V001 is an electric 1080W cotton candy machine for home or commercial use that can produce up to 2 to 3 servings of cotton candy per minute. Just turn it on, wait for it to warm up (about 5 min), pour in the sugar, and this machine starts producing cotton candy as fast as you can collect it! Collect the delicate webs of cotton candy on cones above the bowl. With this cotton candy maker, it's like having two units in one. Choose to use either hard candies or standard cotton candy flossing sugar, and watch as it spins into sweet candy floss. Kit includes cotton candy machine, a large 20 inch stainless steel bowl, sugar scoop, manual, and spare parts kit. Please Note: This machine will only work on 110V / 60Hz power. If you want a clear bubble shield that goes over top of the steel bowl to help contain/collect the cotton candy, we sell them separately (model CANDY-V003).